The Omnipure CL10PF5-C Sediment Cartridge is a polypropylene filter that assists with the removal of dirt, sand and sediment. 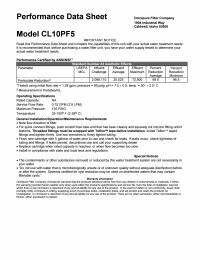 The CL10PF5-C has a 3/8" FPT for easy install. This filter is perfect for ice makers, refrigerators, RO systems and beverage systems for pure water.